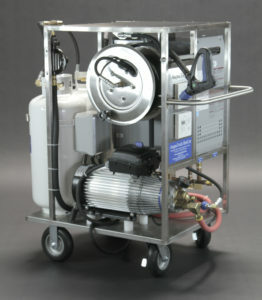 AaquaTools AaquaClean+ is driven by hot or cold high pressure washers producing 4 gpm of flow or more. Fast and efficient porta-potty cleaning of portable restrooms, doesn’t get any easier than this. AaquaClean+ all-in-one Portable Restroom Cleaning System has helped make one of the worlds dirtiest jobs simpler and faster, drastically lowering costs of water and reducing man-hours. With the AaquaClean+ Portable Restroom Cleaning System, you can clean any port-a-potty in less than 10 minutes without brushing or spraying. The system has a custom made stand for cleaning the cabin with the door closed as well as a seat cover for cleaning in the holding tank. Applying high impingement cleaning to the portable restroom industry has saved companies thousands of dollars. The powerful rotating jets of water projected from the AaquaClean+ in a 360 degree pattern quickly cleans the unit interior and holding tank, in a fast and efficient manner using less time and water than other methods. Even tip-overs are a breeze to clean using the AaquaClean+ Portable Restroom.